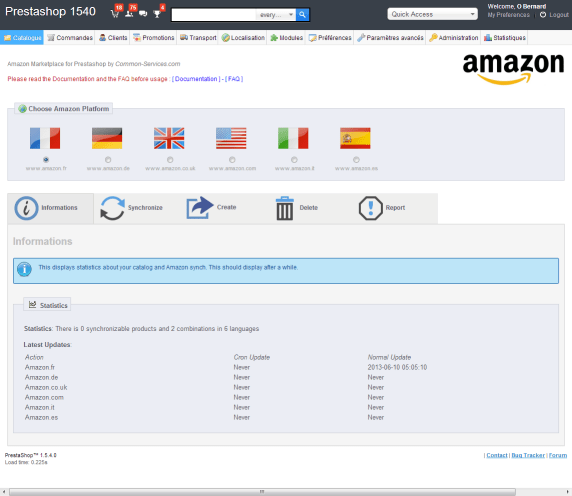 The design of the module Amazon Marketplace dated from Prestashop 1.3, we have therefore undertaken a big facelift for the new version of Prestashop 1.5. The new design integrates a lot better in Prestashop 1.5 and remains compatible with previous versions. The interface is clear and user-friendly. The module offers the possibility to program actions for articles or groups of articles, the preselection. Thus it becomes easy to build up a list of products to create on Amazon, to delete or update. Once articles preselection is done, simply start a synchronization, all pre-selected items will be exported. The module has been ported to Prestashop 1.5. Previously it worked in compatibility mode 1.5 as most of the modules. Now this compatibility mode is inverted, it operates in native mode Prestashop 1.5 and offers compatibility for the previous version. About the users of Prestashop 1.3 and 1.4, the quality of the module is improved, the module also uses Smarty for display in backoffice. However, this has no functional importance but it is simply a guarantee of scalability of the module. The beneficiaries of the option serenity are offered the update. But for those who do not enjoy the support of the 3.7 continues to be insured normally.